Love the photos, especially the self-congratulatory clap at the end. Congrats on your course PR – quite impressive! One question: why no cytomax? Plenty of aid stations? Thanks Jen! Very nice of you. I decided to forego the Cytomax this time because a) it wasn’t hot, and b) I’ve figured out that my body does pretty well in camel mode, i.e. without fluids for at least 2 hours in typical NorCal weather (I actually went almost 3.5 hours without fluids this past Sunday, but only because I neglected to bring water). Truthfully I didn’t even notice the aid stations along the Wildcat course, though Brazen (as with everything else) generally does a mighty fine job with those. Wow – awesome running blog – definitely got a great feel for the course. However, are your photos staged? 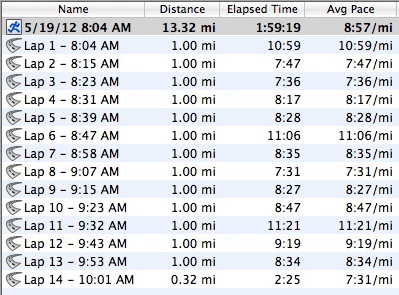 You look way too relaxed for beating last year’s time in a half marathon. Katie too! Ha ha, thanks Brian… one thing you quickly learn when running races is where the cameras are positioned along the course, so you can limit your plastic smiles and false bravado to a few seconds at a time!